A total of 18 graduate teams worked across the UK at our network of Local Hubs. ChroniclesVR is a young company that was founded by graduates Dominic Deane and Rachel Derbyshire, following VR development from its early days, creative it for the culture and heritage sector. Having worked with Victoria and Albert Museum and the Edinburgh Fringe Digital Festival, to name a few. The team will be headed by their Founder and Creative Director Rachel Derbyshire, with their first IP based on historical settings but with a twist and creative story telling. ‘Protect & Survive: The Homeowner’s Guide to Nuclear Armageddon’ is a VR game based around the British Government’s guidelines on surviving a nuclear attack using everyday household items to construct your Inner Core or Refuge, during the 70’s and 80’s. Being made in Unreal for HTC Vive, a time based construction and scavenger gameplay. Collect items such as doors, peanut butter, cushions and miscellaneous objects. Follow the guidelines from your local County Council or Government issued pamphlet and your chances of survival may improve! We are BetaJester, a games development start-up consisting of a hard working indie devs. We have extensive experience in making games that are creative, inspiring and a lot of fun. We’ve been around for the last 4 years, formally becoming a company in early 2015. We are constantly working on new and exciting projects and are regular competitors in major game development competitions across the country. If you want to keep up to date with us, please check out our site www.betajester.co.uk! Here There Be Monsters puts you at the captain’s wheel. Sail your ship across the procedurally generated oceans to discover new lands, new items, new ships, and new monsters. Develop your ship from a small row boat to a gigantic frigate by interacting with the dynamic trading network. Build rapport with traders to expand your trading options, or forgo all trade and take what is yours with unique sea battles with both enemy ships and legendary creatures. Here There Be Monsters lets you explore your own world at your own pace and become the seafarer you always dreamed of becoming! All members of Cold Sun Studios are recent graduates from Futureworks School Of Media. We are a group of hard working individuals who strive to bring new ideas into the industry. Each member has a specialised area in which they excel in however all of us are talented in numerous fields and are ready for any challenge ahead. Tome Travellers is a 3rd person, fantasy brawler that sees up to 4 friends embarking on a mystical journey, fighting enemies, completing quests, solving puzzles and evolving their hero. The combat consists of physics-based arm flailing and tactical analog twisting creating a seriously comedic concoction. Astro Manatee is a team of 4 based in Manchester mostly made up of previous Dare to be Digital entrants. We are composed of Dan who is our Creative Director and Technical Designer, Jack who is the Art Director and 3D Artist, Scott our Sound Designer and Steven our Programmer. Our current project is called Voltaic. It is a top-down multiplayer shooter where projectiles ricochet and players must move to reload creating frantic twitch-based gameplay heavily emphasising movement and encouraging creative play. The game world is designed to look as if it was imagined by what people living in 1800’s London thought the world would look like 100 years from then. Re-Pixelated is a small indie company focused on creating engaging player experiences through mobile games. The team has been together working on game prototypes for three years and this has allowed us to combine our skills in 3D art, coding and games design. We have managed to create a fun working environment that allows us to also maintain a professional standard. We believe we have the potential to create fresh, unique products that can compete in an expanding and dynamic market. Pixillions, is a free to play strategy game where players must battle against an invasion of dead pixels as they trying to take over the lush and energy filled world of Pixillions. Players must take hero Dot, through the puzzle filled, avoider, strategy based levels of each planet in the Pixillion universe. Dot’s goal is to re-connect all of the power generators on each planet. Doing this will restore power to each planet within the Pixillion universe and drive away the dead pixel invasion for good. Dot must be careful however, he doesn’t want to be captured by the dead pixels and suffer the same fate as they do. A small independent start-up company based in Winchester by Bournemouth University graduates in 2015, Blueprint Games is passionate about creating superior and innovative video games for PC and console using Unreal Engine 4. Blueprint Games have created several high quality asset packs for the Unreal Marketplace whilst working on their first game Relapse, a genre bending horror puzzle game inspired by 90’s adventure video games. Relapse is a mash up of two popular gaming genres, horror and puzzle adventure that uses research on the psychology of fear to play with your emotions. Relapse is based in a UK Victorian insane asylum, learn more about life as a patient as you explore the grounds, collect clues, view interactive flash backs and read patient case files whilst avoiding Dirk. Dirk has trapped you inside and you’ll have to solve his puzzles to try and escape before he catches you in his deadly game of hide and seek. We are Duel Fuel, a team of five based at University of South Wales hub. Duel Fuel are a diverse team with each member bringing something different to the table. Our team consists of a lead, one designer, one artist, and two programmers, who all have the same goal of creating a fun and addictive game within the 10 weeks. Infinite Void is an endless runner being developed for IOS and Android. The game will feature a single player and multiplayer version. In single player the players will take on the challenge of getting as far as they can whilst avoiding objects. In multiplayer the players will compete against other in an online battle and to be the last alive. The objects themselves will move down a conveyer belt towards the player, but the lights won’t always be on so both memory and reactions are needed. the virtual environment in a way which mirrors the space available in real life. The core trifecta of game developers originally formed late 2013 for their placement years (2x MEng GameDev/1x BEng CompSci – Queen’s University Belfast), and subsequently, worked on a variety of projects, including Slimebow (iOS/Android) and a funded project from NI Arts Council. Concurrently, the team were Student finalists of NISPConnect’s INVENT 2014. After finishing their education, the core team reformed for Tranzfuser, expanding to five members, including another BEng CompSci graduate (QUB) and a BA Fine Art graduate (Ulster University), with a sell-out, award-winning graduation show. Additionally, three members of the team also graduated from Belfast Enterprise Academy. Project Leitmotif concerns an innovative hybrid battle system crossing Rhythmic and Turn-Based gameplay. During battles, each enemy produces their own musical pattern, or Leitmotif. Players must listen and determine these patterns, and matching these in combat provides large benefits. This makes it so that, while battles may appear similar to Pokémon or Final Fantasy-esque combat (where turns constantly tick towards readiness to ensure flow), depth and interactivity is created through these Leitmotifs. Seeking to blend Guitar Hero and Paper Mario gameplay, while encouraging keen listeners, greater influence upon the traditionally static turn-based structure is provided. Team Curvish consists of Calum Sinclair (3D/Design), Alexander Horowitz (Audio/Programming), and Ahmad Nursalim (Concept/UI), all three of which are soon to graduate from the MSc Serious Games and Virtual Reality programme at the Glasgow School of Art. They originally formed at the Global Game Jam 2016, at which they won ‘Best Gameplay’ for Curvish. The game also went on to win ‘Best Game’ at two IGDA Play Parties in both Edinburgh and Glasgow, before being awarded Tranzfuser funding. The three are now joined by Stephen Wilson (Production/Marketing). 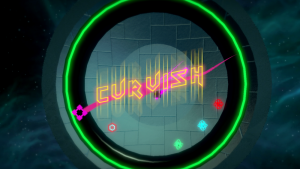 Curvish is a 2.5D skill-based platformer, in which the player pilots a small droid to collect items in specific combinations. Using their abilities to freely rotate the world and triple-jump, players must dodge and avoid dangers to fulfil the objectives of each level. Items must be collected in the exact order, which poses problems for the player as they progress through each scenario. Escalate is a UK based game development team of four working remotely to create new and incomparable video games for a wide audience of gamers. We are driven by the passion for video games and their communities. We aim to create great instances of fun, exciting mechanical play and enticing communities to surround them. With the help of Tranzfuser, Escalate are currently working on their first original IP to be released on both PC and Mobile devices later this year. Escalate is a browser-based cooperative roguelike 2D platformer. Explore an infinite world of procedural and user-created content with your friends, and climb as high as possible! Players spawn at the bottom floor of the world and must travel upwards by placing a variety of blocks to build creative structures real-time. The world is a grid filled with power-ups and endless dungeons containing dangers and rewards. Escalate allows players to create levels (dungeons) which are placed within online worlds for the community to explore. Illicium Game Studio is comprised of Sheffield Hallam Games Software Development and Games Design MArt graduates. The art and design side of the team have a proven track record together, having just finished an innovative party game for the PS4 that won 4 prizes at this year’s Game Republic awards. Of Gods and Monsters is a top-down wave shooter in which chaos has ensued as Hades sets loose his army of monsters upon the world. The gateway to Tartarus, prison of the Titans has unearthed inside an ancient temple. You must prevent Hades’ monsters from breaking open the gateway and releasing the Titans. At times of struggle, you can call upon any of the ancient Greek gods for help, but beware the fickleness of the god’s favour. Appeasing a god will make the others jealous, ignore any of the gods enough and you will face their wrath. Max Rank Studios is a team composed of 3 programmers and 2 Game artists, Max Rank is essentially a collaboration of talented and hardworking individuals that have been working together all year on a larger project, this in turn allowed us to identify each other’s strengths and weaknesses. The next step for the team is creating a product that illustrates to the world that we are ready to achieve Industry standard and compete with Triple A Games. Peekaboo the first game produced by Max Rank Studio, Peekaboo is essentially the hybrid lovechild between the childhood game “What’s the time Mr Wolf?” and the concept of “Lord of the Rings.” The Objective of this project is to produce a Multiplayer game. Players are required to utilise the Map Layout and coordinate amongst each other to avoid being spotted by their opponent. The team have formed through the passion for game making. There is a large pool of skills that cover a wide area of game design. From working professionally together, on university projects and through Game Jams, the team have come together to develop a simple casual mobile game. Bradley a talented artist will be involved with UI design, animation and game-feel. Gav will be working on code and level design. Enrico will be creating themes and sound effects. Tom, the team leader and lead programmer will be bringing everyone together towards the same vision for creating Miracle Tea Studios. Ruya is a casual game inspired by Candy Crush Saga, Dots and Tetris. It’s a simple matching and sorting game where the player must build and swipe a target shape. Random coloured game pieces called mixys bounce on a trampoline and get catapulted in to the selected cell, so the player can build the sequence of colours to swipe. The objective is to complete all the target shapes without running out of spaces. During these 10 weeks we’ll be able to apply a simple level system, improve player progression and add new game modes to increase retention. We are Ludic Gulls. A brand new team, striking a balance between technical proficiency and innovative artistic aspirations in game design. The team is composed of a rare set of recent graduates with substantial relevant professional experience. Every member comes from a different background, having worked on multiple games, providing fresh perspectives and expertise to each of our projects. We are now working on our first as Ludic Gulls. Whodunit Padma? Is a story driven, detective investigation game for PC. In a decadent, socially networked, future society, a murder takes place aboard a space cruise ship. The player takes on the role of the AI controlling the ship: ICMS Padma. By interacting with a cast of eccentric characters through a deep tactical dialogue system, and scanning the scene with its collection of instruments, the player must follow leads, discover clues and utilise a range of upgrades to find out whodunit. Shiny Happy People is a team of four game developers from across the UK, Europe and Asia who first met while studying at university in London. The team takes inspiration from modern narrative exploration games as well as old style point and click adventures. Their aim is to mix the two together, bringing the puzzle gameplay to work together with the story to craft an immersive narrative experience. Year 2083. You wake up in an abandoned high-tech laboratory. Everything around you is falling apart, but you have one power: the ability to jump in time between the present and the past, when the laboratory was still in pristine state. In The Orchid Nebula you will be able to explore, investigate, and use your time travel ability to solve puzzles and uncover the obscure past of the laboratory and its previous inhabitants. 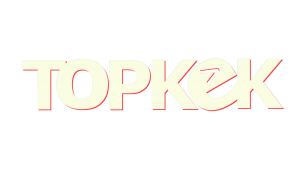 We are Topkek, a group of graduate games designers, artists, and programmers from the University of South Wales. We strive to make games with the player’s experience at heart, built with strong mechanics, and fun gameplay. Topkek is comprised of five members: team leader and designer Lloyd Jones, designer Hoiwing Kevin Ho, environment artists Glenn Booth and Siddharth Ravindran, and programmer Daniel Bailie. The game we’re creating is called The Boden Project. The Boden Project is a new take on resource management and strategy games giving you, the player, stewardship of a ring-world, built by humanity as the next step to our survival in the universe. With an ever-increasing population to satisfy, you must gather resources, produce energy, and please your inhabitants against unrelenting threats including overheating, blackouts, solar flares, and planetary eclipses. Can your ring-world stand the test of time? We’re a group of game development students from Queen’s University Belfast, drawn together by our desire to break into the videogame industry and leave our mark. Good friends, with our handful of similarities and significant differences, driven to create fun games. Adversity in our years together at university nurtured a sense of trust and cooperation in us that led us to apply for Tranzfuser as a team, and we hope to use our talents and passion to contribute to the industry we all love so much. Whatever happens, we’re excited for the adventure. 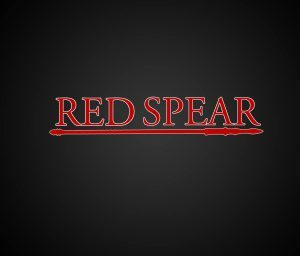 Red Spear’s project is ‘Gravity Stomp’, a team based First Person shooter where the player is in control of their personal gravity, navigating around the map by altering the direction of their gravity at will. The player’s personal gravity also effects their projectiles and weapons, resulting in some unique gameplay interactions. Players use their control of gravity to not only quickly move around the map, but to outmanoeuvre their opponents, attacking them from unexpected directions, and using the titular ‘Gravity Stomp’ ability, which allows players to obliterate enemies underfoot if they land on top of them. We believe that this will be a fresh take on the genre.